10 What To Look For When Buying a Chef’s Knife ? 12 Difference between forged and stamped knives in short! Looking for a new high quality and professional chef’s knife? Well! the market is fully loaded with so many competitive brands and buyers may often find it difficult to choose the best. Choosing the right chef knife will depends on many criteria such as how you are going to use it, how often, grip style, budget and not to mention a plenty other micro-decisions. 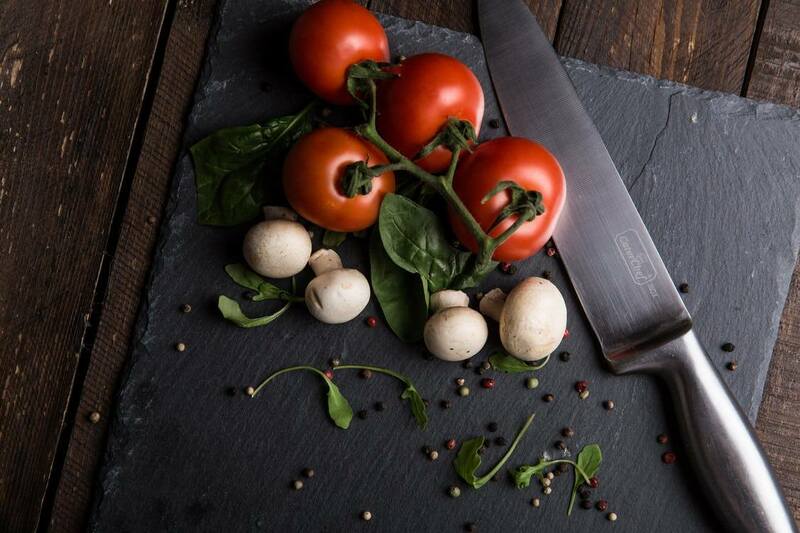 Undoubtedly every cook is looking for top-rated and sharp chef knife that can handle every kitchen task without spend a tons of money, so in this article i have reviewed and rated the seven most popular chef’s knives from the best cutlery brands that are rated high for their outstanding performance and properties. i hope this article helps you find the best rated chef’s knife that fits your cooking style and budget in 2019. *Be warned that this list is not conclusive; several other models are far superior to the ones listed below. However, I wanted these chef’s knives to be more budget friendly for aspiring cooks out there. If you are interested in upgrading your cutting experience, it is high time to look for a high-quality product like Mac professional, its considered as one of the best and sharpest chef’s knives series in the world, with an excellent cutting power which delivered by a thin, durable blade and extremely balanced. I have tested many high quality German and Japanese kitchen knives, and the mac is certainly beats the most of them by price tag, quality, balance, And if you look over, everybody is recommending it. Mac is really making a name for them self with this high-end chef’s knife. The mac professional blade is made of high-quality superior steel, high-carbon chrome molybdenum vanadium alloy, with tungsten to increase hardness even further, to deliver excellent edge retention and maintaining the sharp edge quite an easy job. dimples on both sides of the blade to keep food from sticking to it. Mac professional chef’s knife features a 2.55mm traditional hard thin Japanese blade with a welded-on bolster (western knife shape) to deliver the best slicing experience and extra balance. And symmetrical design to work equally well for both right and left-handed users. A pakka wood handle, it is really perfect for both small and large hands and gives you the total control feeling and a grip allowing you to cut through most foods using minimal effort. In a nutshell, its is a real razor sharp knife great for home and commercial use, hold an edge well, sharpens easily and you can work with it for long hours without any wrist fatigue due to their light weight and well-balanced nature. I definitely recommended it for everybody who is looking for a high-quality chef’s knife. Although it rather expensive but believe me it worth every penny and then some. Those who are not afraid to spend some cash for a superior chef’s knife. Both handle and blade made of High-quality materials. Welded-on bolster to add balance. A high-quality Japanese 8-inch chef’s knife offered by global a trustworthy and a top rated cutlery manufacturer. It’s a great all-purpose kitchen chef knife, a really Well balanced, not too heavy to help reducing hand fatigue, stays sharp for a long time and really easy to sharpen with a whetstone. Most of Global kitchen knives are not forged and the g2 is one of them, yet its made of high-quality steel that has been tempered and heats treated to a new level. The Global g2 professional chef knife made of high-tech molybdenum/ vanadium stainless steel and high chromium content. To grant the blade the exact hardness to retain its sharpness and ease of sharpening. As well the chromium to give the blade an excellent resistance to rust and staining. The best feature of the global G2 chef knife is the large and prominent edge for more and longer sharpness in contrast to the standard beveled edge. A comfortable stainless steel hollow handle filled with the right amount of sand to deliver the best balance. I have noticed after long working hours the handle became slippery and greasy and in my opinion, it is the only drawback of this excellent and sharp knife. Any who is looking for a little more than a typical chef knife. Lifetime Warranty against defects and breakage. Handle get slippery and greasy. Another Japanese cutlery brand with excellent reputation and extremely well-known for their high-end kitchen knives. The Shun Classic features a luxurious and extremely sharp 16 double-bevel blade made of a VG-Max (harder than the Vg-10 which used in shun classic older models) Stainless Steel and sandwiched with 34 layers of high-carbon stainless steel(SUS410), 17 layers on each side. to display the stunning look of Damascus steel, a hardness of 61 Rockwell to hold a sharp edge extremely well for a long time, extra corrosion and rust resistance. A highly polished pakka D-shape handle which adds extra balance and a better grip, you are going to love the way it fits your palm no matter if it is small or big. and a short bolster to add more room for your thumb and index to have a better pinch grip. *if you are a left-handed then this chef’s knife is not the best for you because of the D-shape handle(designed for right-handed users). and if they found something wrong with the knife they will send you a new one. Clad with 32 layers to protect the knife from rust and corrosion. VG-Max Steel hold edge sharpness for a long time. Life-Time warranty and free sharpening. Some customers complain about blade thickness, therefore its prone to chip. A top-rated cutlery manufacturer and widely known for its high-quality and first-class kitchen knives, Wusthof based in solling Germany operating since 1814, that means a full highly experienced and trustworthy company. Wusthof manufactured many top-rated chef knives, but in this article, I have reviewed the Wusthof Classic Ikon 8” Chef knife. So let’s start with the blade, which crafted from fully forged x50CrMo15 steel which known as high-carbon stain-free steel. Tempered to 58⁰ Rockwell score to provide long sharpness time. Wusthof added PEtec edge technology to this knife model to make 20% sharper with twice the edge retention. And angel tapers from the spine to the cutting edge and a tapers from the bolster to the tip to give the knife extremely sharp edge, strength as well as flexibility. 3 bolsters one to give a counterbalance when using the knife, the second adds blade control and forward bolster allows you to sharpen the whole length of the blade. and all 3 of them combined together provides the knife with the exact heft and balance for effortless cutting. Finally, since the knife is forged it’s heavier than stamped knives, it’s great for whom prefer the weight of the knife for cutting. Full tang for superb robustness and triple riveted for even more resilience. the Handle is made of African wood and formed with a comfortable unique shape to add more control, ease of use and feels like an extension to your hand. the broad curve of the blade combined with the gentle weight of the handle makes the cutting motion very fluid and easy on your wrist. For those who is looking to get the most bangs for their bucks. Full tang that riveted to the handle for a better control. Compared to other knives ikon 8 got an unbeatable price. Bolster design to add more weight and balance. If you prefer a lighter-weight chef’s knife, these knife isn’t likely to be your favorite. Mercer Culinary has been on the market for more than 30 years comparing to other brands it a short period of time. That being said, Mercer Culinary has proven itself over the years that is an excellent manufacturer of kitchen knives and culinary tools. Mercer culinary Genesis 8” chef knife is one of the best knives I have ever own, High-Quality, comfortable handle, lightweight, good-balanced, and the best part? it is affordable. forged from One Piece high carbon German stainless steel to provide the best stains and corrosion resistance to this chef knife, And the hardness of 58 HRC Rockwell. I like the stability and the ease of honing provided by the taper-ground. As well as the short bolster that adds more strength, durability, extra balance, better grip, and easy sharpening too. Since mercer genesis is forged knife it features a Full tang for superb robustness and a short bolster for a better pinch grip. Ergonomic handle made of Santoprene(plastic and rubber) which has a high strength and stiffness properties. In addition to comfort-ability and safe slip-resistant grip. To summarize, an excellent all-purpose Chef knife offered by great brand with a bargain price and probably one of the best choices you can make right now if you are on a budget. Anyone who needs a superior quality without spending a fortune. Best price for such an excellent knife. Perfect for left and right-handed users. Comfortable handle and safe grip. One brand that is synonymous to knives is Victorinox. Victorinox is a Swiss company founded in 1884, well known for its Swiss army knives, pocket knives and Professional Kitchen Knives. The Vicotoinox Fibrox is one of the best-selling and best affordable chef knife on the market. This all-purpose chef knife is an essential tool in every modern kitchen. I will start with the ergonomic handle because it’s the most thing I like about this chef’s knife. Victorinox Fibrox pro Feature a non-slip Fibrox handle to provides a sure grip and easy handling even when wet or greasy, making the knife extremely comfortable to work with for an extended period of time. The handle makes a superior combination of the lightweight and well-balanced blade to reduce hand and wrist fatigue. The blade is made of stamped high carbon stainless steel Aka x50CrMoV15 which dominant use is for high-quality and professional knife blades, with a hardness of 55-56 HRC Rockwell and good corrosion resistance. Comes with 50/50 western bevel blade, meaning it has a symmetrical angel on each side which makes it perfect for right and left-handed users, besides a long and sloping curve to make mincing and chopping fun and easy. The only thing I didn’t like about this chef knife, is the half tang blade which is less stronger compared to the full tang. but I didn’t face any issue with this until now. Just getting into kitchen knives? and looking for a sharp chef knife? This is an excellent option for aspiring cooks. Best price for a high-quality knife. Blade needs to be sharpened frequently. The J.A Henckels 8” class chef knife made of a high-quality German stainless-steel fully forged to provide durability and rust resistance. The most things I like about this chef knife is the full tang triple rivets Polypropylene handle which makes the knife more sturdy and robust and easy to handle even when wet or greasy. Long-Lasting sharpness blade and beveled on both side which makes it entirely symmetrical for right and left-handed users. I recommend this chef knife to everyone who can’t afford expensive kitchen knives. Especially if you’re looking for a forged chef knife with good quality and heft, the J.A 8” classic gives you the best quality for a decent price. Those who’s looking for hefty and sturdy knife, without the hefty price tag. Made of high quality German stainless steel. Dishwasher safe ( but not recommended). The best chef’s knife which managed to stand out to us was the Mac Professional hollow edge, thanks to the superior design, high-quality materials, well-balanced, and comfort-ability. Choosing Mac Professional hollow edge chef’s knife as our best pick wasn’t a difficult task, but I am not saying that the other options are not good, every knife above is special somehow. For instance, if you’re into pure beauty and great features then global G2 or shun Classic is your way to go, if you have smaller-sized hand Wusthof and shun should be your first picks. But if you’re on a budget or novice cook and you don’t want to spend too much money on kitchen knives then the 3 last options are great for you. And if you are of those who spend a lot of time preparing and cooking, using a food processor can make your life easier and save you a fair amount of time, it will help you mince, dice, chop, knead and mix food in safe, faster and more convenient way, make sure you read our best food processor reviews. Did I miss one of your favorite chef’s knives? What To Look For When Buying a Chef’s Knife ? Clearly, its one of the first essential features to consider before buying a chef’s knife. not only makes dealing with food easy and effortless but also allows the blade to slice smoothly through ingredients without damaging the protein cells which help to preserve the texture and the flavor of the food. therefore, be sure to purchase a chef knife not only sharp when you buy it, but also will stay sharp and easy to sharpen. the sharpness of the knife specified by the edge angle the lower its get, sharper the knife. If the Edge sharpness specified by the edge angle height, why not all the knives are sharp? the easiest way to explain this, try to sharpen a pencil, the sharper it gets, the easier it breaks. the shape of the edge and sharpening the knives to the exact angle to give the knife the best sharpness for a long period. Well-Balanced knife meaning the handle and the blade are equal in weight. and the best way to test it is to grip the knife by its handle, if the knife tilts either way then it is probably unbalanced. and unbalanced means hard work and wrist fatigues. and you should stay away from unbalanced knife if your planning to work with it every day all day. For weight it is a personal preference, you should try several knives to know which knife is best for you. as they are made of soft steel ( most of the western knives are made of high-carbon Stainless Steel). they are much sharper and have better edge retention than western knives, but they prone to chip and crack easily if misused. Difference between forged and stamped knives in short! Just like how it’s portrayed in the movies a blacksmith with a hammer pounding the steel to shape it. But of course today most of the knives are made by machine. 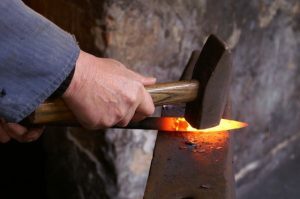 Forging is generally considered to make knives with superior edge retention, strength and less fixable but is more costly. There are several ways to identify forged knife, the first one is to look for a bolster it’s a mound of metal between the handle and the blade; indeed I prefer to have it in all my knives its provide more control, balance, and sort of fingers protection. Any knife that has a bolster is certainly forged, despite some forged knives do not have bolster like Japanese knife. The second thing to look for is a partial or full tang, yet some stamped knives have tangs too. Partial tang when the blade is inserted into the grip for part of the length. then sharpen, polishing, adding the handle to the blade process. Stamped knives feature a lighter weight than forged knives, and much flexible and cheaper. But it doesn’t mean that forged knives are better than stamped there are a lot of high-quality stamped knives on the market like Victorinox. More flexible which make it perfect for fillet. Need to be sharpened from time to time. tend to keep an edge for a shorter amount of time.